I’m scheduled to do an HTTPS conversion today, and tonight I’ll be scaring my little trick or treaters for Halloween. So, I’m not sure when I’ll be able to do the live recap. If I can do it this afternoon I will. If not, then Wednesday afternoon for sure. I’ll post on Facebook and Twitter when I know. Happy Halloween to all of my US peeps who celebrate. Thankfully there is no scary site news to report this week, and for that we are all thankful. Y’all may have noticed that I changed up the intro music on Tips Tuesday. The software I had been using to produce the final podcast version is super duper old and finally bit the dust. The new software has different music, so thought I would give it a try. If we don’t like it, I may grab the old one and/or try something else. Just want to mix things up a bit. New can be fun sometimes. Since I opened up the After HTTPS Check service a whole bunch of site owners signed up for it. After they saw all that was missing, many of them decided to have that free HTTPS switcharoo trickery undone and get a real HTTPS conversion. To my surprise, many of those decided to also get full site audits and put their whole site on a better foundation for speed and security, which are tied hand in hand together now. Everyone who has had their site checked in either service is running a lot faster now too, due to several speed changes we made rather quickly. The new Chrome warning hasn’t gone into full effect yet. So there’s still time to get your site checked and fixed, even if you choose to stay with the freebie HTTPS way. I’ve worked with several clients now that have received pretty good conversions from their hosts. But, the one big thing they, and the users of the Really Simple SSL plugin are missing is the proper settings for the HSTS security header. On several occasions we have seen that header was added, but it does not have all of the settings needed to qualify for the Chrome safe site preload list. You’ll see it when you try to submit your site. It will be required by Chrome in the future. So, if you’re not sure how your HTTPS configuration is set up, come get a check. Takes about 30 minutes and it’s all live. You may recall a couple of Tips Tuesdays ago that I linked to some nice tips for repurposing your content. I have not been doing as well with that this year as I needed to. So, I checked out CoSchedule. It’s a super duper service. But, it also slows down site performance. At the prompting of webmaster Larry Snow I decided to give Buffer a try. I’m liking the free version just fine for now. Thanks so much for the suggestion Larry. I still like Hootsuite for reading Twitter and the organization of tabs it provides. But I’m liking Buffer better for scheduling. So, will give it a run for a few more weeks and see if I want to move up to the paid version. I also thought it would be nice to mix in snippets of some of my YouTube videos. But, selecting a start time in the middle of a longer video doesn’t seem to work well when sharing on social media, just on embeds. So, I may start making my own clips and uploading them directly to the social media platforms. That’s a bit more of a pain than just sharing a YouTube link, but for snippets from each week’s Tips Tuesday live recap, it may be worth it. We’ll see. Thanks to webmaster Michelle Phillips of Codefetti for helping with all the settings on the wpDiscuz plugin. We had a much more successful test of it on this redo. We also found a couple of bugs and/or feature improvements that we’ll be contacting the dev about too. We wrapped up all the tests yesterday and I want to send a huge thank you to the 20+ folks who volunteered to help test. Y’all rock!!! 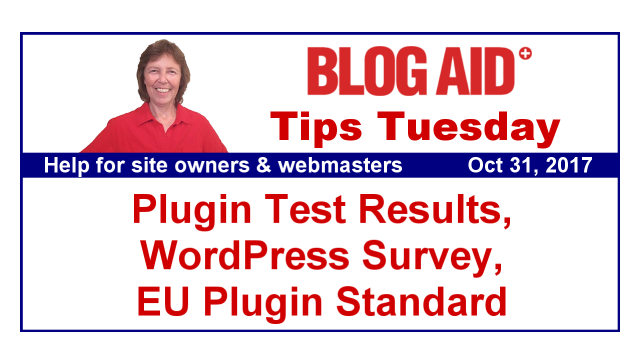 I’m finishing up with my evaluation and comparison post this week on all the plugins we tested. So look for that post soon. And I’ll be doing in-depth reviews and tutorials on the top plugins. I believe there will be 3 good ones for you to choose from, depending on your needs. This past weekend I started my tests of the WP Rocket plugin. They had a major overhaul to it earlier this year, so I wanted to run fresh tests. The new interface is super nice. But the performance is about the same as it was in my head-to-head caching tests this time last year. So, I still stand behind those recommendations for now. I’ve got a few more tests to run on special settings, though. So I’ll finish those up before making new tutorials for Webmaster Level 4. And, they have a few new features coming out soon that I want to check out too. Now that I’m just about caught up with all the tests I had I planned to do by this time of year, but had to postpone due to the HTTPS frenzy, I’m switching gears to focus on the revamp of the DIY SEO course and SEO Workshop, plus other new mini courses. I plan to have the first of those launches in a couple of weeks, and they will continue through spring. BlogAid News subscribers will be the first to know about them. A whopping 80 changes were made in the latest Beta 4 release. We’re roughly two weeks out from the public release, so I’m betting they are close to having a Release Candidate soon. That means they stop making all tweaks and just focus on bug fixes. You may want to get a sneak peek at the new image widgets that are coming. They are sweet!! You may remember last week I had a conniption fit over WP threatening to put a notice at the top of the admin page in WP 4.9 to give the new Gutenberg text editor a try. It’s still under development and is nowhere near ready to be put on a live site. Thanks to webmaster Larry Snow for alerting me to a WPTavern article stating that WP heard the community outcry over this and decided not to include the header or invite. But, they also remarked that it may be in WP 4.9.1. I’m also beyond relieved to get confirmation that the TinyMCE Advanced plugin will indeed work with Gutenberg. We’ll be able to use it in the standard Text Box. Thank you to webmaster Marcy Diaz of Amethyst Website Design for this pleasant heads up. The nice folks at Team Yoast set up a testing environment to get feedback from 40 end users of diverse site ownership backgrounds on the new Gutenberg text editor. Well worth reading the feedback for yourself, but pretty much confirms that this thing is not ready for prime time yet. I hope the WP devs listen. And I want to thank Yoast for his active involvement in trying to help us cross this bridge into WP’s future. It’s time for the annual WordPress user and developer survey! Only takes 5 minutes to complete. It is so radically important for WordPress devs to hear from end users like me and you. Else, they only hear from other devs. And let me tell you, they paint a very different perspective about what should and should not be in WordPress. So please, take a moment to complete the survey. Your voice matters more than you know!!! Have you updated to PHP7 yet? If not, you really need to. WordPress has updated their minimum standards to require PHP 7. See my post on why and how to do your own PHP 7 update. I found PHP 7.1 to be too unstable to recommend widely. And soon, PHP 7.2 will be out, as noted in this post from Torque. It’s a minor release, so no need to jump right on it when it launches. Just so you’re on 7.0, that will be good enough for now. Just don’t keep putting this update off, else your plugins will start to break as they increase their minimum version requirements too. The bottom will now be version 5.6. Bloggers who run ads, heads up! If you thought that EU Cookie Law thing was a pain, wait until you see what they are cooking up now! They are creating a standard for all plugins that collect data of any kind. The EU General Data Protection Regulation (GDPR) will be go into effect May 28, 2018. This GDPR related site is creating a way for plugin developers to validate their plugins to ensure they are in compliance with the new law. It hasn’t launched yet, but you can get on the email list for when it does. Please let me know if your ad network is addressing this new set of conditions yet. In fact, you may want to check with them to see if they’ve even heard about it. Some of those ad networks are more on the ball than others. The popular Postman SMTP plugin was removed from the WordPress repository a few weeks ago due to a major XSS, or Cross Site Scripting security issue. This is the most common of all vulnerabilities and has hit multiple popular plugins and even WP, sometimes more than once, as code changes and hackers find new holes. The plugin has been taken over, or rather forked by a new dev and long-time user of the plugin. He has created a new version of it and fixed the security issues. Look for it in the repository under the new name Post SMTP Mailer/Email Log. More details on the WPTavern post linked above. Thanks to webmaster Michelle Phillips of Codefetti for the heads up on the change. Google’s Mobile First initiative is already doing a soft roll out. Here’s a guide on Crazy Egg to help you ensure your site is ready. Do everything on it except for the AMP part at the top. My clients who have tried AMP say they wish they had never done it. I don’t think I would try the PWA replacement for AMP either. But everything else in the guide is spot on. Single optin will now be the default on MailChimp. Starting October 31, single opt-in will become the default setting for all MailChimp hosted, embedded, and pop-up signup forms. All MailChimp signup forms—including all of your existing forms—will shift from double opt-in to single opt-in. This change will occur automatically; you don’t need to make any manual adjustments within your account. The overall signup process will change: when single opt-in is enabled, the opt-in confirmation emails and the signup thank you page will not be sent or displayed. Moving forward, you’ll have the option to enable double opt-in within your account’s list settings. Microsoft has launched a new site performance and security tester called Sonar. Wow, what a complete waste of time this thing is. Took 2 hours to run the scan and results were a bunch of bogus BS things. An example – one of the global security headers was not needed for 39 specific links that are scattered all over the site. Another is having a protocol relative link for social media platforms is not okay. Ever wonder why your speed scores are so different between GTMetrix, PageSpeed Insights, Pingdom, and WebPage Test? This post from GTMetrix does an admirable job of explaining it. In my mind, one of the reasons I don’t trust Pingdom is what this article points out about when the test is complete. For Pingdom, it’s on-load time only. My workhorse tester, WebPage Test, shows on-load and fully loaded and so much more. Many folks use Pingdom and think they have no issues because the load time is faster there than on other testers. And now you know why. You’re not getting the full story. Where you test from matters too. GTMetrix defaults to Vancouver Canada. You have to create an account and log in to use the Dallas location. WebPage Test has more locations than any of them, and you can choose location, browser, and screen size all at the same time, and without logging in. The dev who built WebPage Test has been working for Google for the past couple of years and lots of new tests are popping up that are super helpful. Just one more reason I rely heavily on it. Webmasters, look for new videos on how to run the different testers, as several of them have changed their interfaces since I made the last set of videos. Site owners, look for new tutorials on how to run image optimization tests and such too. FireFox has announced end of life on the Firebug dev tool. I’m sorry to see it go, as I used it a lot back when I was still designing sites. But these days I rely more heavily on Chrome dev tools. Did you use Firebug or something else? Thank you! So 4.8.3 rolling out – did anyone see that coming? And 4.9 in 2 weeks!